The owners of this stunning self-catering rental near Bayeux in northern France have reduced their prices by a huge 25% for remaining weeks this summer. And to help you get there, when you book accommodation with Holiday France Direct, you benefit from 20% off Brittany Ferries’ car and passenger fares! Gite Renoir is only a short drive from Brittany Ferries’ arrival port of Caen/Ouistreham. Step into this stylish gite located in Normandy’s rolling countryside and take in the airy, open-plan lounge/kitchen perfectly equipped with your comfort in mind including a 32” tv and free wi-fi. Both the double rooms are en suite and have classic French-style beds and linen. Gite Renoir is a short drive from Bayeux and if history isn’t your thing, the town offers a lovely choice of chic boutiques and restaurants plus a big Saturday market. The property is also well placed for visiting the WW2 Landing Beaches and the resorts of Deauville and Trouville. And back at Gite Renoir, you can relax in the garden or even indulge in a reflexology or massage session which the owners can arrange. 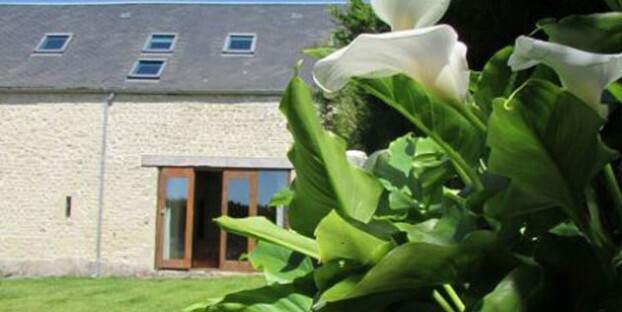 Example Price: You can stay here for £440 pw between 4th July and 28th August, costing just £110 per person in a party of 4. Offer applies for stays between 4th July and 28th August 2015. The prices quoted of £440 and £110 are the prices for the week or per person with 25% discount already applied. The price per person of £110 is the amount per person with the house fully occupied (4 persons).